Nice replacement accessories for Garmin Vivosmart HR. The size can be adjusted to fit 5.70"-8.26" (145mm-210mm) wrist. Easy to assemble and remove through pins, with Screwdriver and Nuts. Using high quality soft silicone material, protects your Garmin Vivosmart HR from dirt and scratches and secure while running, dancing or working out, perfect for daily and nightly wear. 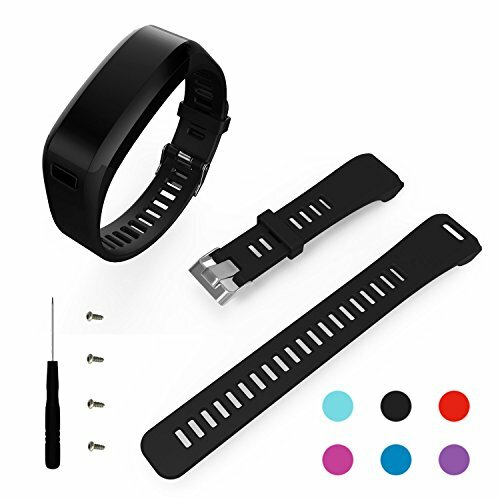 BeneStellar 1-Pack soft silicone band for Garmin Vivosmart HR (No Tracker, Replacement Bands Only) + 1*Screwdriver + 4* Screw nuts.